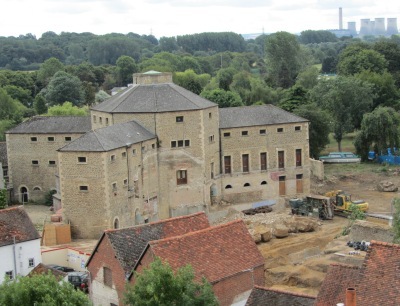 Looking down from the museum roof, not a huge amount of building activity has happened in July. Archaeological excavations have progressed and more of the earth has the look of being dug over or terraced. 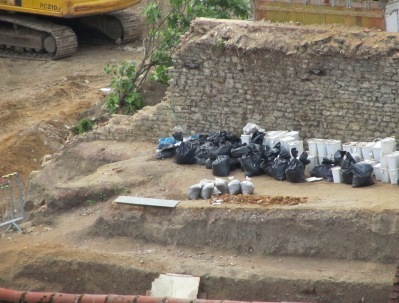 It also looks like a lot of material has been bagged and boxed up for going through with a teaspoon at a later date. 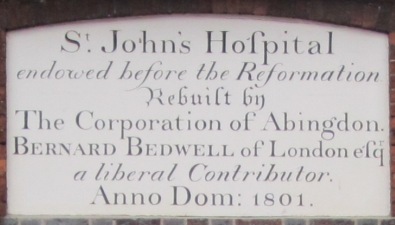 The ſ (or long s) in St John’s Hoſpital, which looks like our modern f, died out in the decade before and after 1800 according to a wiki article on Long_s . The way fs were increasingly being written back then led to confusion and so ſ was replaced by s.
All of that is just an aſide to the main purpose of this blog post which is to point out that the entrance to St John’s Hoſpital, the almſhouses on the Vineyard, is being refaſhioned at present. 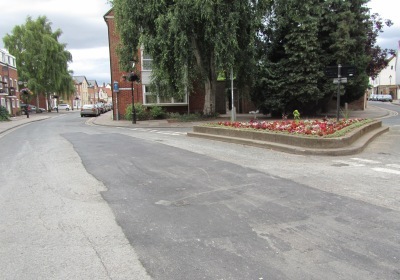 At the end of June I said that West St Helen Street was the most uncared for street in Abingdon. 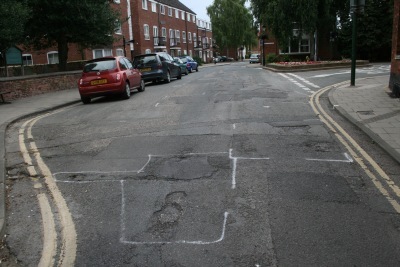 About a week later white boxes got drawn round the ruts and pot holes. 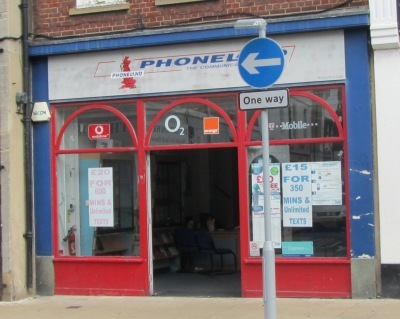 Then yesterday morning I awoke to the sound of road mending, and visited to take a picture. The workman thought I wanted the picture in order to complain because they had started so early. “Far from it” I said, and returned this evening to take another picture, now the job is done. 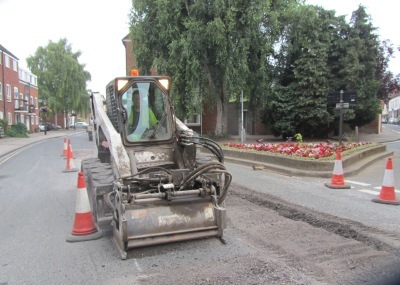 Looks like the backlog is getting cleared now that the County Council have a new contractor. 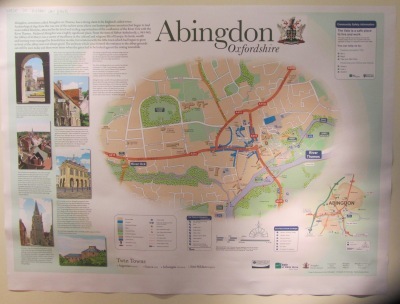 The old Abingdon tourist maps are looking very faded. 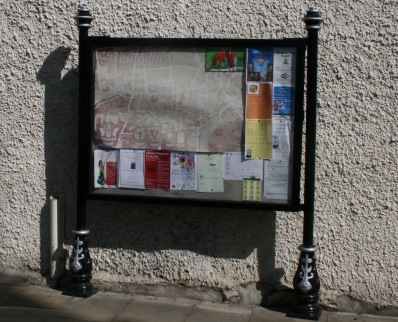 The frames have already been repainted by the town council because new maps are on the way. The new maps have been on display in what was once Adams children’s wear. 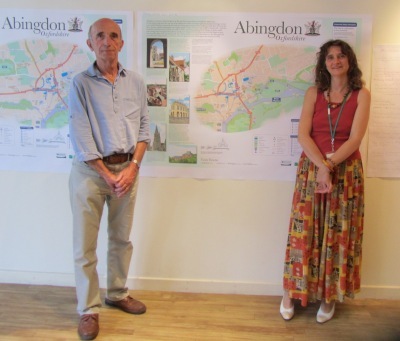 James White and Heather Brown, from Choose Abingdon, were there to explain about the project and listen to comments and suggestions. A group of volunteers from the community had already helped in the initial design, deciding what should be shown and how. Each map, destined for a different location, has a different centre of focus, and a different ‘You are Here’. 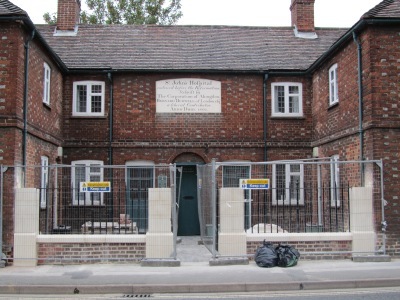 The pictures at the side are by Peter Bellingham – including some new ones of East St Helen Street, County Hall, St Helen’s Church, and Old Gaol.